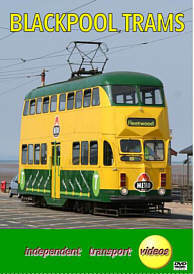 Blackpool Trams are known the world over. They have been operated since 1885, making it Britain's first electric street tramway. The corporation took ownership of the company in 1892. The system expanded and the Blackpool & Fleetwood Tramroad Company was taken over in 1920 and gave the corporation a through tramway to Fleetwood. In 2008 the tramway runs 11 miles from Starr Gate in the south to Fleetwood in the north. Our filming begins at Rigby Road tram depot where some of the trams are being prepared for service. We then move to Starr Gate, the southern terminus and continue to make our way along the promenade, pausing at Manchester Square, the Tower, Bispham, Cleveleys and reaching the northern most terminus at Fleetwood. There i plenty of action that features the famous ‘Balloon’ cars which date from 1934 and various rebuilt cars both double and single deck. We also take some tram rides to capture the atmosphere found on these unique vehicles. There is a bonus feature of a return ride from the Tower to the Pleasure Beach on heritage car No. 147. Recently reacquired from America and fully restored to its former glory, this really is a special treat. We also take a look back to the 1960’s with some excellent footage cine taken by Bob Webster of Blackpool trams running in Blackpool town centre, along the Promenade and at Fleetwood. The early 1990’s are also captured with some of our early video footage. To complete this journey to the seaside we present a photo gallery from our own archives of trams in service in 1979, 1982 and 1986. There are also some shots taken at Crich in 1978. Duration : 95 minutes (approx).